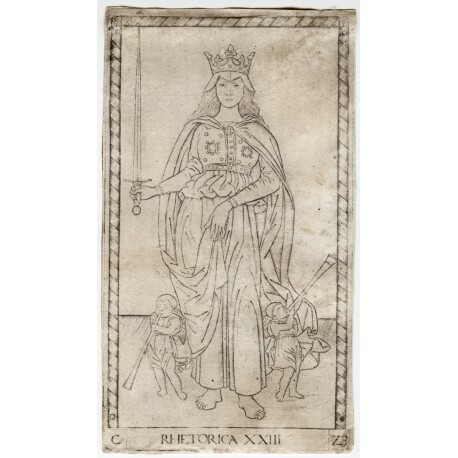 This print belongs to the first version (conventionally designated E-series) of a group of fifty engravings known as the “Tarocchi Cards of Mantegna” – despite being neither true tarocchi nor related to Mantegna. “Rhetorica” is one of ten images in the third group of the set (marked with the letter C and numbered 21-30) personifying ten “Liberal Arts”: the classical seven known as the trivium (Grammar, Dialectic or Logic, Rhetoric) and quadrivium (Geometry, Arithmetic, Music, Astronomy or Astrology), raised to ten by the addition of Poetry, Philosophy and Theology. Many critics place the “Tarocchi” among the most important of the incunabula of printmaking in Italy. It appears that the fifty matrices were repeatedly struck, without alterations, perhaps over a period of twenty or thirty years, during which various colours of ink were employed: grey, bluish green, greenish grey, greenish brown, with the ink always watery and thin in quality, often with enhancements in gold. The present impression is softly printed in a delicate grey ink. It was acquired by the Museum of Fine Arts, Boston, in November 1897 (Henry Foster Sewall bequest), and deaccessioned in 1918, since when it has been in private collections. engraving (180/181 × 101 mm), lettered at lower left C, at lower centre rhetorica xxiii,and at lower right 23; enclosed by a frame of diamonds (outline of four nail holes within the border, as usual). Softly printed in a delicate grey ink. Only a single state is known. Fair impression; full plate mark. ‘Rhetorica’ is one of ten images in the third group of the set (marked with the letter C and numbered 21–30) personifying ten ‘Liberal Arts’: the classical seven Liberal Arts known as the trivium (Grammar, Dialectic or Logic, Rhetoric) and quadrivium (Geometry, Arithme­tic, Music, Astronomy or Astrology), raised to ten by the addition of Poetry, Philosophy and Theology. The artist is believed to have worked directly from literary sources, such as Martianus Capella’s De nuptiis philologiae et mercurii, a work of the fifth century widely read, taught, and commented upon through­out the Middle Ages and Renaissance (first printed in Vicenza, 1499). The presence of the two children blowing horns may have been suggested by the opening words of Capella’s description, in which Rhetoric walks to the music of trumpets. 1. The Sewall Collection as acquired by the Museum of Fine Arts contained approximately 23,000 prints. A deci­sion to sell duplicates was quickly made and the first sale (conducted by C.F. Libbie in Boston) was held on 16–17 November 1909. Two further sales were conducted by Libbie (20 January 1910 and 10–11 March 1910); a second sale by Anderson Galleries occurred in New York on 4 February 1921. 2. The literature is immense; recent scholarship includes Kristen Lippincott, ‘Mantegna’s Tarocchi’ in Print Quarterly 3 (1986), pp.357–360; Le muse e il principe: arte di corte nel Rinascimento padano, catalogue of an exhibition held in the Museo Poldi Pezzoli, Milan, 20 September–1 December 1991, edited by Alessandra Mottola Molfino and Mauro Natale (Modena 1991), pp.436–437 no. 101; Giordano Berti, ‘I cosiddetti Tarocchi del Mantegna’ in A casa di Andrea Mantegna: cultura artistica a Mantova nel Quattrocento, edited by Rodolfo Signorini (Cinisello Balsamo [Milan] 2006), pp.298–307, 454–457; Susanne Pollack, ‘I cosiddetti “Tarocchi del Mantegna”’ in Cosmè Tura e Francesco del Cossa: l’arte a Ferrara nell’età di Borso d’Este, catalogue of an exhibition, Palazzo dei Diamanti, Palazzo Schifanoia, 23 September 2007–6 January 2008, edited by Mauro Natale (Ferrara 2007), pp.398–403 nos. 107–122. 3. Hind, op. cit. (1938), i, p.228: ‘No impressions are known showing differences of state, or later re­work’; cf. Mark Zucker, in The Illustrated Bartsch, 24: Commentary, op. cit., p.6: ‘There are no impressions showing later rework to the plates’. 4. For details, see Hind, op. cit. (1938), i, p.229. 5. Cleveland, Museum of Art, Dudley P. Allen Fund, 1924, 432.1–50 (Rhetoric: 1924, 432.23). Matched set from the Strogonoff collection, Rome; ‘weak, but early’ (Hind, op. cit., 1938, i, p.229). All prints reproduced on the CMA’s image database (http://www.clevelandart.org). 6. Galleria degli Uffizi, La collezione delle stampe, compi­led by Antony De Witt (Rome 1938), p.17 nos. 142–191; A casa di Andrea Mantegna, op. cit., pp.454–457 nos. 100–105 (reproducing pls. 3, 16, 22, 30, 32). 7. Florence, BNF, B. Rari 193 (formerly Magliabechiana E. 6.7.17); see Giannino Giovannoni, Mantova e i tarocchi del Mantegna (Mantova ), reproducing pls. 12, 15, 34–37, 40, 48. 8. Reproductions: Hind, op. cit. (1909); Hind, op. cit. (1938–1948), pls. 320–369 (Rhetoric: pl. 342); also repro­duced on BM’s database (http://www.britishmuseum.org/). 9. La raccolta di stampe di Carlo Firmian nel Museo di Capodimonte, catalogue of an exhibition, Castello del Buonconsiglio, 21 June–31 July 1984, by Rossana Muzii Cavallo (Trento 1984), pp.20–37 no. 1 (all 50 prints reproduced; Rhetoric: p.28). 10. 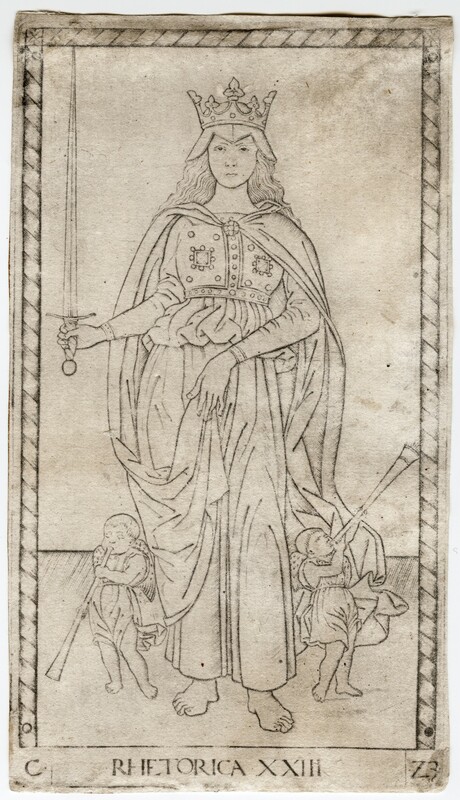 Reproductions: Laure Beaumont Maillet, Suites d’estampes de la Renaissance italienne dites Tarots de Mantegna ou Jeu du gouvernement du monde au quattro­cento Ferrare vers 1465 (Paris 1986); Bibliothèque nationale de France, Les premières gravures italiennes: Quattrocento – début du cinque­cento: Inventaire de la collection du département des estampes et de la photographie, compiled by Gisèle Lambert (Paris 1999), pp.146–160 nos. 277–326 (Rhetoric: p.152 no. 299). 11. Reproductions: I tarocchi detti del Mantegna, texts by Claudia Cieri Via and Elena Calandra (Pavia 1992). 12. Hind, op. cit. (1938), i, p.229, as complete except for pls. 1, 26. 13. Boston, Museum of Fine Arts, Harvey D. Parker Collection, P967 (ex H.F. Sewall collection, pur­chased 1897), M25969 (ex Brayton Ives collection, his sale 12–14 April 1915; see Emil H. Richter, ‘New Acquisitions of the Print Department’ in Museum of Fine Arts Bulletin 13, 1915, pp.64–65). Reproduction of P967 on the MFA’s image database (http://www.mfa.org/collections). 14. Hind, op. cit. (1938), i, p.229, as complete except for pl. 5. 15. Within a part-set (ex-collection: J.P. Heseltine, lacking pls. 9, 26, 50); see ‘Gift of a Set of Tarocchi Cards’ in Bulletin of the Art Institute of Chicago 18 (September 1924), pp.73–74. Reproductions on the AIC’s database (http://www.artic.edu/aic/collections/artwork/11481). 16. Reported by Hind, op. cit. (1938), i, p.230; Mark Zucker, in The Illustrated Bartsch, 24: Commen­tary, op. cit., p.34. 17. Reproductions: Le muse e il principe, op. cit., pp.436–437 no. 101 (pls. 11, 14–16, 18, 19); Pollack, op. cit., nos. 107–118, 120–122 (pls. 5, 6, 11–20, 27, 39, 42). 18. Reported by Mark Zucker, in The Illustrated Bartsch, 24: Commentary, op. cit., p.34. 19. The Illustrated Bartsch, 24: Early Italian Masters, op. cit., pp.150–199 (Rhetoric: p.122). 20. National Gallery of Art, Early Italian engravings from the National Gallery of Art, edited by Jay A. Levenson, Konrad Oberhuber, and Jacquelyn L. Sheehan (Washington, dc 1973), pp.81–157. Eighteen of the NGA’s impressions derive from the group (42 prints) assembled by Friedrich August ii, King of Saxony (1797–1854), via Lessing J. Rosenwald (presented by him to the NGA in 1943); twenty-three derive from the collection of George Cumberland (1754–1848; his An essay on the utility of collecting the best works of the ancient engravers of the Italian school, London 1827, pp.52–68), via the Royal Academy of Arts, and P. & D. Colnaghi & Co., who dispersed the set hors catalogue after 1967 (see James Fenton, School of genius: a history of the Royal Academy of Arts, [London] 2006, pp.291–292). 21. Previously offered by Sotheby’s, Catalogue of Important Old Master engravings, etchings and woodcuts, London, 26 April 1979, lot 117, when unsold (estimated £20,000–£25,000). The Sotheby’s catalogue describes the group as ‘47 plates from the set of 50’ (lacking pls. 19 ‘Clio’, 23 ‘Rhetorica,’ and 32 ‘Chronico’), ‘later fifteenth-century impressions (? ), showing wear’. When it reappeared in Christie’s, prints of ‘Clio’ and ‘Chronico’ were supplied. Prior to their appearance in Sotheby’s, the prints had been mounted (with 38 others) in an album assembled by the collector Natalizio Benedetti of Foligno (1559–1614). The album was dismembered for sale by Sotheby’s, with the prints by other Masters offered individually (as lots 108, 111–114, 118–121, 187–188, etc.). A determined bidder succeeded in ‘reconstituting’ the volume, and in this new guise it was exhibited at Foligno in September-October 1990; for a discussion of the rehabilitated album, see Bernardino Lattanzi, ‘La mostra dei Tarocchi a Foligno’ in Bollettino Storico della città di Foligno 14 (1990), pp.565–572 (reproducing plates 3, 19, 28, 33, 41, 49 from the series; and six of the other prints formerly in the album, by the Master es, Israhel von Meckenem, and unidentified printmakers). A document listing books owned by Benedetti (not including this album) is transcribed by Luigi Sensi, ‘Natalizio Benedetti e la sua collezione’ in Peiresc (1604–2004). Actes du colloque tenu à Peyresq du 26 au 30 août 2004, Sciences et Techniques en Perspective [Louvain], second series, 9 (2005), pp.153–171; the same document is printed by Veronica Carpita, ‘Natalizio Benedetti e Nicolas de Peiresc: dal gusto per le “anti­caglie” agli esordi dell’archeologia’ in Peiresc et l’Italie: actes du colloque international, Naples, le 23 et le 24 juin 2006, Istituto italiano per gli studi filosofici, Palazzo Serra di Cassano, edited by Francesco Solinas (Paris 2009), pp.105–156. 22. Ex-collections: British Museum, Tomás Harris, the latter’s sale by Sotheby’s, Catalogue of impor­tant old master engravings and etchings, London, 23 March 1965, lot 49: ‘some small nicks at the edges’, £600 (to Laube). 23. Ex-collections: British Museum, Tomás Harris, the latter’s sale by Sotheby’s, Catalogue of important old master engravings and etchings, London, 23 March 1965, lot 50: ‘two small tears at the edges’, £520 (to W.H. Schab).